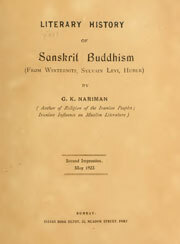 The publisher was Oxford’s Clarendon Press in 1896, and the translator was the famous Japanese scholar Junjiro Takakusu (1866-1945), whose _Essentials of Buddhist Philosophy_, frequently reprinted, is still a useful overview of Buddhist philosophy from the perspective of sectarian developments in Japan. The text is packed with notes, and even a sprinkling of Chinese characters, as necessary. The contents are detailed and as might be expected from the title. 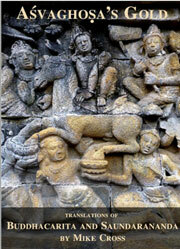 This book presents the period Of Buddhist Ascendency, from the Non-Brahmin Point Of View. This study is based on coins, scriptures and other ancient records. It explains points formerly undiscovered and undebated point of view. 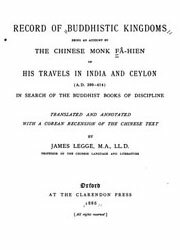 An Account By The Chinese Monk Fa-Hien Of His Travels In India And Ceylon (A.D.399-414) In Search Of The Buddhist Books Of Discipline. A valuable resource for anyone researching the formative stages of the Buddhist Sangha. 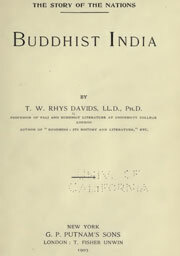 Features translations of the historically-relevant sections of the Tibetan Dulwa (Vinaya) important for understanding the central holy places and the foundation that enabled Buddhism to take hold in India and maintain a core of essential unity while also nurturing the growth of distinct schools that preserved and transmitted manifold dimensions of the Buddha’s teaching. That there was a vast literature embodied in Sanskrit by Buddhist thinkersis attested even by the sparse references in classical Sanskrit to them and by an occasional find of a Buddhist work in a Jain bhandara. Thus there is a gap in our knowledge of Sanskrit literature which this book is intended to supply. 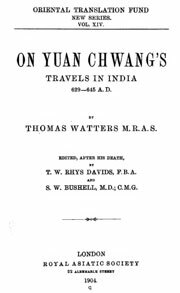 On Yuan Chwang’s travels in India, 629-645 A.D. This book is about the well-known travels throughout India. In the seventh century of our era, of the celebrated Buddhist pilgrim Yiian-Ohuang (Hiouen – Thsang). 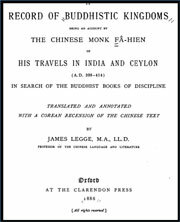 Mr. Watters discusses and identifies all the Sanskrit names of places, etc., transliterated in the original Chinese text, and adds an elaborate index of the persons mentioned in the course of the travels. 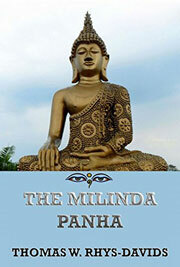 The Milinda Panha (Pali trans. 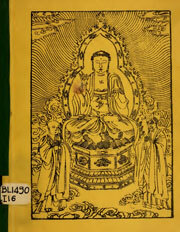 “”Questions of Milinda””) is a Buddhist text which dates from approximately 100 BCE. 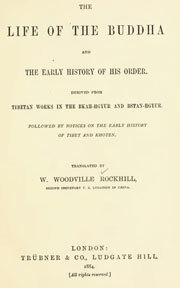 It is included in the Burmese edition of the Pāli Canon of Theravada Buddhism as a book of the Khuddaka Nikaya; however, it does not appear in the Thai or Sri Lankan versions. A shorter version of it, however, is featured in Chinese Mahayana translations. It purports to record a dialogue in which the Indo-Greek king Menander I (Pali Milinda) of Bactria, who reigned in the 2nd century BCE, poses questions on Buddhism to the sage Nāgasena. The Therigatha (Therīgāthā), often translated as Verses of the Elder Nuns , is a Buddhist scripture, a collection of short poems of early women who were elder nuns (having experienced 10 Vassa or monsoon periods) from around 600 BCE. 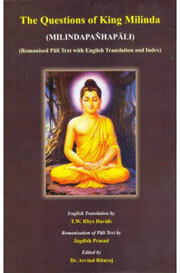 In the Pāli Canon of Theravada Buddhism, the Therigatha is classified as part of the Khuddaka Nikaya, the collection of short books in the Sutta Pitaka. It consists of 73 poems organized into 16 chapters. 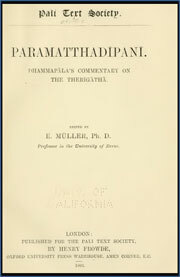 In editing Dhammapclla’s commentary on the Therigatha I have made use of a paper manuscript in Sinhalese characters which was sent to me by Subhilti in the beginning of 1891, and which is a copy of the palm-leaf manuscript described by Pischel in the preface to his edition of the Therigatha, p.. 119 (C). This manuscript was copied and corrected very carefully by Subhuti and his pupils, and, in fact, a great many of the clerical errors which occur in Pischel’s extracts of the commentary, and therefore must belong to the original manuscript, have been avoided in this copy. For the last seven years, at the therapeutic snail’s pace of one verse per day, I have been translating two works of Aśvaghoṣa known in Sanskrit as mahā-kāvya, epic poems or epic tales. They are not exactly works of fiction; they are based on historical fact, but only loosely. In any case, they are not to be taken too literally, because they are so full of metaphor and – in the gap between their ostensible and hidden meanings – so full of irony.Some teachings, like the Buddha’s four noble truths, are well represented both on and below the surface.